Beyonce is an American artist originating from Houston, Texas who has been active since 1997 and is today regarded as one of the greatest artists in the world of music, particularly in R&B and pop music. She is a singer, a songwriter and a record producer in the world of music; outside of its, she is also an actress, a choreographer, a dancer, a model and even a fashion designer. She is currently signed onto the record label Columbia Records and has worked with a number of other artists including Jay-Z, Destiny’s Child, Kanye West, Solange Knowles and Lady Gaga. Anyone fond of good music will definitely want to grab this opportunity to watch her live by booking Beyonce tickets and then waiting for her to perform live at an unforgettable concert. Beyonce sent social media into frenzy after hinting at Jay Z’s infidelity on her latest album, Lemonade. The audio visual masterpiece from Queen Bee had tongues wagging after she alluded that her husband had cheated on her with a “Becky with the good hair”. Her fans immediately went on a witch hunt to discover who this Becky could possibly be and the names of singer Rita Ora and designer Rachel Roy were thrown about. However, there has been no official statement from the power couple, who it seems, want to let their music do the talking. Reports are now emerging that the duo have recorded a joint album secretly and it will deal with the ongoing rumors about their relationship. The details of the album are not available but sources claim the LP will be released on Tidal in the near future. Only recently, Beyonce’s mother, Tina Knowles, confirmed that Lemonade was about betrayal, infidelity and cheating, but did not confirm if the subject of the album were her daughter and son in law. Beyonce and Jay Z have been married for eight years and are parents to a four-year old daughter, so Beyonce’s allusion to infidelity caught many by surprise and gave rise to a lot of anger among fans. Hopefully, the couple’s new album will put the rumors to rest once and for all. From a musical view point, fans should look forward to the LP, since the duo usually produces hits when they collaborate. Examples of their hits include “Crazy in Love”, “Drunk in Love” and “Lift Off”. Beyonce grew up in Texas and studied at a number of performing arts schools where she was surrounded by dancing and singing competitions at a young age. In the nineties, she joined the R&B girl group Destiny’s Child as its lead singer which rose to fame and became one of the Best Selling Girl Groups of All Time. In 2003, when Destiny’s Child was on hiatus, she released her first album titled as Dangerously in Love. This album led to tow number one hit singles on the Billboard Hot 100; Baby Boy and Crazy in Love and was ranked as one of the most successful albums of 2003. It also led to her winning a record five Grammy Awards. In 2006, Beyonce released her second album titled as B’Day soon after Destiny’s Child disbanded. Three songs from this album Irreplaceable, Déjà vu and Beautiful Liar ranked in the top ten of the charts. In 2008, Beyonce released her third album titled as I Am Sasha Fierce which contained the hit songs Halo, Sweet Dreams, If I Were a Boy and Single Ladies (Put a Ring on It). This album broke her first album’s record and earned her six Grammy Awards, making her the female artist with the most Grammy Awards won in one night. In 2011, she released the album 4 which, like all her previous albums, ranked first on the Billboard 200 charts. She became one of only three artists in the history of music to have had the first four releases rank number one on the Billboard 200 chart. Outside of music, Beyonce ventured into the world of acting when she starred in a number of movies including Carmen: A Hip Hopera, Austin Powers in Goldmember, Cadillac Records, Obsessed and Dreamgirls. She was honored with two Golden Globe Awards for her performance in Dreamgirlds. In 2005, she also launched her own fashion line with her mother under the name of House of Dereon. Five years later, she released her first perfumer, the sensational Heat scent. In the world of advertising, like many other artists, she has endorsed a number of brands including Pepsi, L’Oreal, Tommy Hilfiger, Vizio and even Nintendo. She has been ranked number one of the Forbes 100 Most Powerful and Influential Musicians in the World. She was also ranked number two on the Forbes 100 Most Powerful and Influential Celebrities in the World. And if that isn’t enough, People magazine ranked her as the World’s Most Beautiful Woman. When it comes to awards, no one can boast of more awards than Beyonce ; she has won a record sixteen Grammy Awards, four American Music Awards, eleven MTV Video Music Awards, the Billboard Millenium Award and a Hollywood Walk of Fame star. Beyonce is an artist who has sold more than seventy five million records in the world making her one of the Best Selling Artists of all time. VH1 ranks her as one of the 100 Greatest Artists of All Time and one of 100 Greatest Women in Music, feats that make her someone no to miss by grabbing Beyonce tickets now. Described by Entertainment Weekly as ‘a storm system disguised as a singer,’ Queen Bey recently posted a video on her Instagram page with Jay-Z, announcing the confirmation of their co-headlining On the Run II tour. Beyonce’s live performances are known to be packed with energy. Her sensual dance moves and amazing vocals are a treat to watch live. And when she is joined by husband and bestselling rapper Jay-Z, the result is bound to be nothing short of spectacular. The power couple have successful solo careers and their love story has made headlines time and again. So watch Beyonce and Jay-Z on the run by purchasing Beyonce tickets in time. After nine years Beyoncé has finally managed to give a number one Billboard Hot 100 hit with her duet “Perfect” with Ed Sheeran. According to Nielsen Music, the single has sold 181,000 downloads. Though Queen Bey gave three chart-topping albums in the last decade, but none of her songs from these went to reign at the top. Last time, she saw one of her songs at number one was “Single Ladies” in 2008. Though the singer cannot take complete credit for this number one hit, it is nonetheless an achievement that brings a 9 years drought to an end. This also marks Queen Beys’ sixth Hot 100 number one of her career. The ‘Orange is the New Black’ star Laverne Cox recently confirmed that she is collaborating with singer and songwriter Beyonce on a new project. The announcement came via Instagram with the caption “Yes it’s true. I am collaborating with Beyoncé on a new project. #QueenBey herself.” As of now, it is not clear as to what exactly the two artists are working on but fans are super excited and anxiously looking forward to the project. Pregnant Beyoncé enjoying some family time in New Orleans! After an incredible performance at the 59th Grammy Awards that stunned everyone, Queen Bey is taking a much deserved break. On Saturday night she was seen having lunch with Jay Z, daughter Blue Ivy Carter and her sister Solange Knowles and her son Daniel Julez Smith at the Big Easy hotspot Willa Jean, a Southern comfort food restaurant. It looked like some good family fun and the group even posed for the lucky fans present. According to the sources, the 35-year old was glowing and in a good mood being surrounded by her loved ones. A day earlier she was spotted shopping as well. When the winner of 22 Grammy Awards announced her pregnancy earlier this month, the social media went crazy. While many were wondering if she will perform at the upcoming Coachella festival, the diva says she is up for it. Nothing beats the joy of watching your favorite music artist perform live! Beyonce's concert dates are out and fans are looking forward to the upcoming shows. The next concert will be held in Portland at the Port City Music Hall on 27-Sep-19. For complete information regarding dates and venues, please visit our website. For the upcoming Beyonce Events, the average ticket price is $173, with tickets ranging from $18 to $387. Ticket prices change however based on event dates. For example, the average ticket price for Beyonce Event (Portland) on 27 September, 2019, is $173, while the average ticket price for the Beyonce Event (Portland) on 27 September, 2019, is $173. Q:I want to purchase multiple Beyonce tickets from your website. Can I do that? A:Of course! 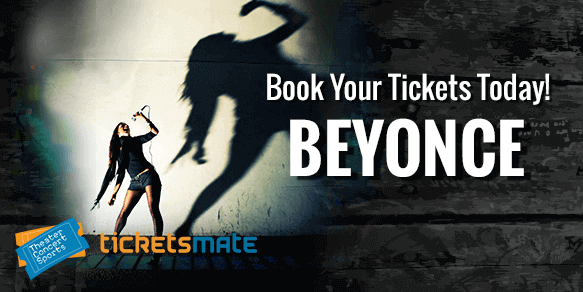 You can buy as many Beyonce tickets from our trusted brokers via our website as you want. There is no restriction on that. However, if you are planning to buy them then it is recommended to do so at the earliest as her concert tickets tend to sell out fast. Q:Will I be able to purchase Beyonce tickets from your website on the day of the event? A:You will be able to buy your Beyonce tickets from our website on the day of the event but only if our trusted brokers are offering them at the time. Since she is a global superstar, there is a chance that the tickets to her concert will sell out pretty fast. So, it is recommended to buy your tickets early in order to avoid the any hassle. Q:How much is a Beyonce ticket for her show in Glasgow? A:Beyonce will be performing her exciting show with Jay-Z in Glasgow on June 9, 2018. If you want to watch Queen B live in her element then you can buy your Beyonce tickets for that show from our trusted brokers at an average price of $260. Q:Can you tell me the cost of Beyonce tickets for her concert in Cardiff? A:Beyonce and Jay-Z are setting out on a joint tour once again. This power couple is scheduled to perform at the Cardiff Millennium Stadium on June 6, 2018. We have Beyonce tickets in stock thanks to our certified brokers so, if you want to watch her special performance live then buy them today. Currently, you can purchase these tickets at an average price of $251. Q:What is the cost of Beyonce tour tickets for her show at the Empire Polo Field on April 20, 2018? A:The winner of twenty two Grammys, Beyonce will be hitting the road with her husband, Jay-Z. The duo is scheduled to perform at the Empire Polo Field on April 20, 2018, so, if you are interested in attending that show then you can buy Beyonce tickets from our website today. As of now, our trusted brokers are offering them at an average price of $802. Q:Can you please tell me the price of Beyonce tickets for her Copenhagen concert? A:Beyonce and Jay-Z are embarking on a tour together and they soon will be playing music at the Parken Stadium in Copenhagen on July 23, 2018. You can buy Beyonce tickets for that event from our brokers. They are selling them at an average price of $257 on our website. Q:When will Beyonce perform at the Etihad Stadium Manchester? A:Beyonce is going to start, 'On the Run II' tour with her husband Jay-Z soon. The duo will be bringing their exciting shows to Manchester where they will take the stage at the Etihad Stadium Manchester on June 13, 2018. Our reliable brokers have Beyonce tickets for that show. So, buy them now if you want to catch her amazing performance live. Q:How much is Beyonce tickets for her performance at the London Stadium? A:Beyonce is scheduled to hit the stage at the London Stadium on June 15, 2018. If you would like to watch Queen B perform her hits like, Formation and Sorry live then buy you can buy Beyonce tickets from our certified brokers. The average price of these tickets is $348 at the moment. Q:Can you please tell me when will Beyonce perform at the Levi's Stadium? A:Sure! Beyonce has announced a show with Jay-Z at the Levi's Stadium in Santa Clara on September 29, 2018. This is perfect chance for you to experience her exciting performance live. Go purchase the very sought after Beyonce tickets from our trusted brokers quickly. Q:When will Beyonce perform at the Mercedes-Benz Superdome? A:Beyonce has announced to perform a show at the Mercedes-Benz Superdome in New Orleans on September 13, 2018. Since she is one of the most famous R&B acts around, it is no surprise that the demand of Beyonce tickets is increasing very quickly. So, if you want to watch her live in concert then it is recommended to buy your tickets soon. Q:When will Beyonce end her tour? A:Beyonce and Jay-Z are scheduled to end the tour by performing their final show of the trek at the CenturyLink Field in Seattle on October 4, 2018. If you are looking forward to attend that show then you can purchase your Beyonce tickets from our certified brokers today. Q:How much are Beyonce tickets for her Berlin concert? A:The husband-wife duo is returning to the stage as the "On the Run II" tour dates have now been confirmed. Beyonce Tickets are now available on our site for her Berlin concert, the average price being $274. The minimum get in price is $239. On The Run II: Beyonce & Jay-Z tour will stop at the Olympiastadion Berlin on June 28. Q:What is the lowest Beyonce tickets price you are offering on your site? A:Due to the overwhelming popularity and demand for Beyonce tickets, they are relatively high priced than rest of the concert tickets available on our site. North American concerts rates are not out yet, but her show in Cardiff on June 6 is so far the lowest priced, average ticket rate being $251. The price list will be updated soon so you can return for more details on the North American leg. Q:How much do Beyonce tickets cost if I buy them well in advance? A:Beyonce tickets price vary for shows in different cities. The cost will more or less remain the same even if you buy early as "On The Run II: Beyonce & Jay-Z" is the hottest tour right now. Fans are going crazy over the tickets and don't care how much they have to pay to see the power duo live in action, setting the stage ablaze together. Q:Are the rumors about Beyonce and Jay Z on the run tour true? A:They definitely are not rumors anymore. Jay-Z and Beyonce both confirmed their "On The Run II" tour that includes 36 performances in North America and Europe. Beyonce Tickets for the trek are now available as the husband-wife duo gear up for a spectacular run. Q:How much will the Beyonce Tickets cost me? A:With seventeen Grammys to her name, Beyonce ranks among the most successful artists of all time. Book your Beyonce Tickets and catch her live in concert. We are offering tickets as part of different deals and prices so that you have the freedom to book them without going out of your budget. Log on to our website, make your way to the relevant page there and follow a few simple steps to book your tickets in just a matter of a few minutes. Q:I have lost my cheap beyonce tickets so can I have them replaced free of cost? A:No, you will now have to buy new cheap Beyonce Tickets in order to attend this memorable event. Q:Can I use cash to book beyonce tickets 2018? A:No, we don't accept cash so you will need to use a credit card in order to buy Beyonce Tickets. Q:When can I see beyonce in concert? A:To check out her tour dates please visit our website's Beyonce Tickets page. Q:When will I receive my beyonce tickets 2018? A:You will get your Beyonce Tickets soon after your order is processed during the specified days. In case of any delay please contact our sales reps.
Q:What are the best sites to buy beyonce tickets? A:We are offering Beyonce Tickets on discounted rates with special offer codes. Use them and place the order right away. Q:How can i get cheapest ticket for beyonce? A:We don't promise cheapest Beyonce Tickets but are offering them on reasonable rates with special offer codes. Use them and place the order.